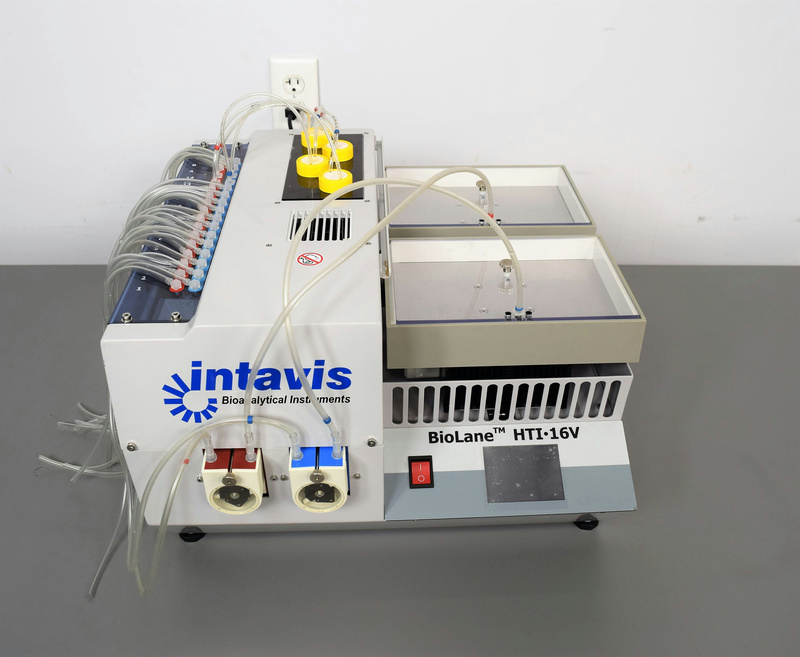 Intavis Biolane HTI-16V In Situ Hybridiziation Immunostaining Western Blotting . New Life Scientific, Inc.
*Tested to heat, shake, and pump. Tested, in good working and physical condition. New Life Scientific technicians tested that this product demonstrates proper functionality with rocking, heating, and pumping. The unit initializes, passing all self-tests, and both trays rock, tray 2 heated to the setting 65º C but tray 1 was set at 22º C. A run was started to test both pumps and to flush tubing with distilled water. No trays, slides or bottles are included with this unit. The BioLane is an economical solution for automating tedious routine lab work, such as in situ hybridization and immunostaining on embryos or sections on glass slides as well as western blotting. Two independent platforms enable the system to run two independent protocols at the same time.